We all have a great potential to impact positively to the environment with the food we choose to eat. Eating locally grown mushrooms is not only delicious and nutritious but has a very low fossil fuel use. Helsieni provides tools for growing mushrooms at home. Every year millions of tonnes of coffee waste are sent to the incinerator or landfill. However, coffee grounds are a great source of nutrients. As coffee grounds are available almost in every home they make a perfect growing place for mushrooms. In addition, the coffee making process sterilizes the grounds, so they don’t require any processing if the grounds are used fresh. Helsieni wants to inspire everyone interested in gardening to consider growing mushrooms at home. Helsieni Growkit is a do-it-yourself kit that contains everything you need to start growing fresh oyster mushrooms (Pleurotus Ostreatus) on coffee waste. Oyster mushrooms require very little water and energy to grow. Because they are rich in vitamins, minerals and amino-acids they are very nutritious food. On average one Growkit will yield 2 to 3 batches of mushrooms. That is up to 600 grams of mushrooms altogether. The same Growkit will provide yields also in the future after proper treatment. Helsieni aims also to be part of Helsinki’s sustainable food ecosystem. 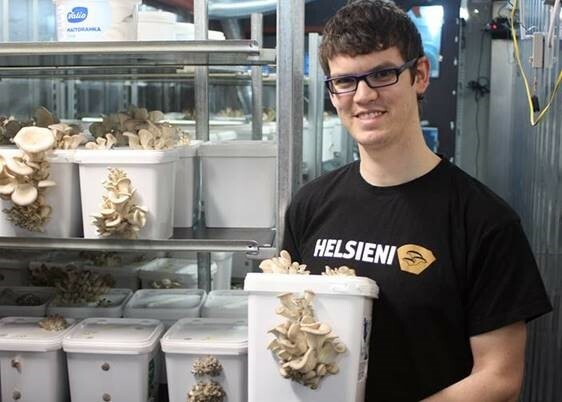 Helsieni has built and designed an urban mushroom farm for sporeless oyster mushroom production from two shipping containers. The Helsieni Urban Mushroom farm is located in Varisto, Vantaa. They collect local coffee waste and oat husks, a byproduct of the oat milling process, that is suitable for mushroom cultivation. The mushrooms are sold to local restaurants and markets. The total output capacity of the farm is around 200 kg of mushrooms per month. After harvesting the mushrooms the spent mushroom substrate is composted or sold to gardeners as mulch. The author Chris Holtslag is Co-Founder of Helsieni. Helsieni Oy was founded in 2016. It has two employees.